I met Jeff Mello (Bootleg Biology's founder) while he was living in the Arlington, VA. Shortly after, he moved to Nashville where he moved his small yeast lab to a commercial space. Jeff sent me a few isolates to grow for the Modern Times souring program. In 2014 he floated the idea of isolating and packaging a blend for me, but at the time I didn't have any microbes that I thought of as mine. We could have pulled something out of a solera barrel, but honestly I never loved the fermentation character of either of them. After running a cobbled together saison blend through my sour gear 10 times over two years, sometimes harvesting from kicked-kegs, I don't know which yeast and bacteria thrived or mutated, but it makes great beer! It has been interesting to have Bootleg Biology pull out the component microbes and put them back together. I've brewed a couple test batches with pre-release cultures with promising results (see below), that were good enough to release it and see what other brewers think! If you do buy a pack, please leave a comment here to let me know what you brewed, fermentation temperature, and the results! 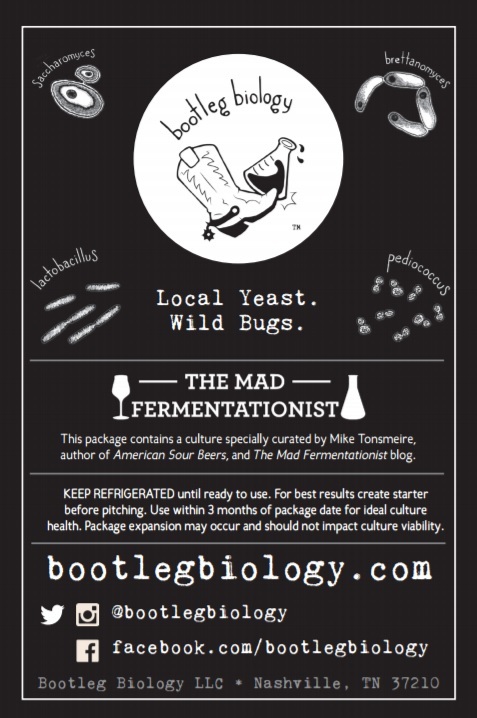 Bootleg Biology is proud to announce: The First Official Mad Fermentationist Culture! Fine tuned over two years, this blend morphed over time to become an elegant powerhouse of classic Saison spice, stone-fruit Brett, lactic tartness and a dry but well-rounded body. The final master blend consists of Saison yeast, wild Saccharomyces, rare Brettanomyces and an opportunistic Lactobacillus culture. At temperatures as low as 68F (20C) The Mad Fermentationist Saison Blend exhibits a relatively clean primary fermentation profile and high attenuation. Traditional saison temperatures (around 80F/27C) bring out citrus and elevated phenols (pepper and clove). The Brett character shifts depending on wort composition, as maltier beers emphasize cherry and stone fruit qualities. This blend integrates beautifully with fruity and tropical hops, with the unique Brett culture keeping hop aromatics crisp and bright for an extended time. For best results use a highly fermentable wort, dry hopping during the tail of active fermentation, and carbonating naturally. 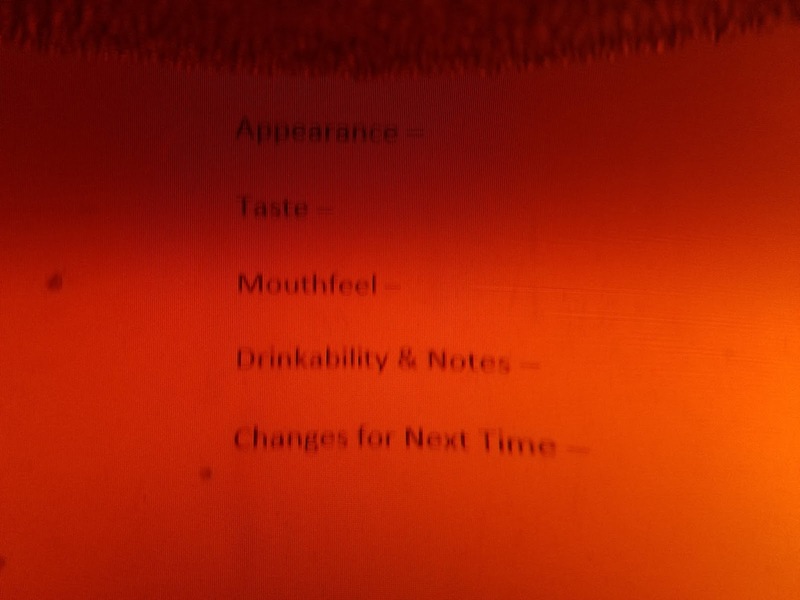 Here are the tasting notes and recipe from the batch I brewed with the second test-pitch from Bootleg Biology. I bottled it more than three months ago, just three weeks after brewing. One of my favorite things about this blend is that it dries out beers quickly, leaving little for the low-attenuating Brett to ferment. The result is a beer that you can bottle young and enjoy as it morphs from bright saison into wild ale! This batch was actually Audrey's first on the big system after a couple 2.5 gallon batches. I acted as assistant brewer. She was aiming for, "a dark Belgian wheat, with maltiness between a dunkelweiss and an English dark mild." She used an experimental hop supplied by Yakima Valley, ADHA-527, which they describe as: "floral, citrus, huge mint, herbal, mellow spice, thyme, Saaz-like, cucumber, sage, touch of lemon." Seemed like some good and bad, a nice pairing with funk! Smell – Fermentation leads with toasty malt following. Still has some underlying Belgian spice and pear, but Brett is beginning to takeover. It is a really approachable leather-cherry funk though. Nothing over-the-top or too animalistic. Maybe a hint of anise and a little clay, hard to place the source. Appearance – Clear, perfectly not a hint of haze. Pretty light-brown beer-bottle color. White head exhibits solid retention. Taste – The caramel malt plays with the funk. Chocolate rye provides more toasted bready than harsh roast. Still a fresh maltiness despite the layer of leather and cherry from the Brett. No acidity thanks to the hint of hop bitterness. Dry, but with enough left to support the malt. Subdued hop bitterness. Mouthfeel – Firm carbonation, nothing excessive. Glad this blend retained the ability to dry out a beer quickly and stabilize. Doesn’t taste as thin as the FG would suggest, but it’s no milkshake! 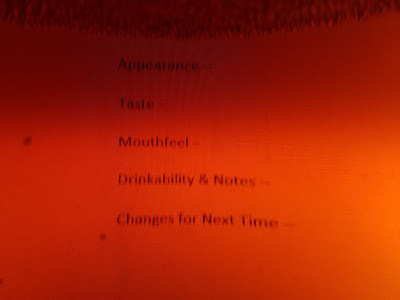 Drinkability & Notes – I can’t think of a beer to compare this to. Really balanced between malt, hops, and fermentation in a Belgian sort-of-way, but not in a combination I’ve tasted from a Belgian or Belgian-style beer. Changes for Next Time – Not a blow-you-away beer, but I can’t think of a tweak to suggest that wouldn’t changing what it is: a unique malty, funky, subtle, drinkable beer! Filtered DC tap water, no other treatments. 3 gallon cold sparge. Chilled to 70F with IC. Half fermented with WLP510, four month old pack, no starter. Half fermented with Bootleg Biology Mad Blend #2, super-fresh, no starter. 11/12/16 Kegged the WLP510 half. Down to 1.011. Bottled the "Mad Blend" half (4.25 gallons at 1.003) with 3 5/8 oz of table sugar. Looking for 2.6 volumes of CO2. Lovely! Quick question : why are there airlocks on the bottles sitting in the background of the picture? Cheers! Those are various dregs and fruit cultures I have ready to go for when I need microbes. 1. How hop-sensitive is the lacto in this blend? To brew a beer with strong tartness, is it important to keep the IBUs as low as possible? It seems as though that might be the case based on the recipe you posted, where you noted "No acidity thanks to the hint of hop bitterness." Or was that more of a tasting note? 2. The product site states: "Pitching Rate: Directly pitchable into 5 gallons of 1.050 or lower wort." Would you recommend a starter for higher-gravity batches, or would that throw the ratio of microbes off? Would it be better to pitch two packages? Thanks! Really excited to brew with this. Just placed my order! I am definitely excited to try this out. I am thinking I'll go with my normal rye saison recipe - 70% weyermann floor malted pils, 20% wheat, 10% flaked rye. I think I'll make a double batch and pull half off after ~15 minutes before I add any hops to see how it sours over time. The rest will then get bittering and a charge of NS, citra and mosaic at KO and dry hop. Not very hop tolerant Lacto. I've seen 3.8-3.9 final pH for most moderately hopped recipes. I'd leave hot-side hops out if you want it to sour more. No problem mashing a starter, or repitching. It had seemed pretty stable the last year or so. Looks like a delicious split batch! Let me know how it turns out! Just bought the saison house blend and pedio sour weapon, thanks for heads up! Mike, you may have covered this before, but why do you insist on natural carbonation (as opoosed to CO2 in keg)? Do you think yeast metabolism in the bottling stage creates new flavors, or is it just to reduce any amount of oxygen in the bottle. I think natural conditioning brings out the Brett character. Not a requirement, but a tool I often use for mixed-fermentation beers. If I'm not planning on drinking the beer quickly, I also enjoy tasting the beer as it progresses during cool storage. I really, REALLY appreciate how quickly you answer questions on your blog, Mike. 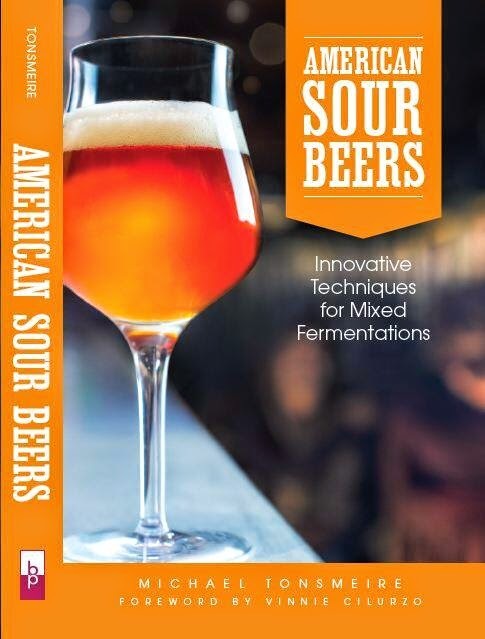 Also, I have your book (of course) and have seen you on numerous podcasts/videocasts, such as Brad Smith's BeerSmith or whatever it's called, CBM University, and a week or so ago on Experimental Brewing with Conn and Beechum and I should say you (along with Randy Mosher) are my favorite interview subject. Eloquent and thoughtful, a lot of information and useful advice. Please do it more often! Cheers, Mosher is fantastic. I really enjoy talking beer; recorded a couple episodes of The Sour Hour last week while I was in California. My Brewing Articles page has links to all of the podcasts I've done. Was hoping an opportunity like this would come someday. This will be my first time using brett for my home brewing and I have a question about harvesting and reusing the yeast culture. I have an Ss Chronical, but I am apprehensive about using wild yeast and bacteria in it due to risks in future beers, so I am going to use my glass carboys for wild beers. What is the best method for harvesting and reusing yeast from a glass carboy? Good thinking, better safe than sour! You can just swirl up the yeast with the remaining beer and pour it into a mason jar or flask until you need it. Then measure it out and pitch, or make a starter if you are store it for more than a couple months. I don't think there is a need to wash the yeast if you are only repitching a few times. Glad it gave you a nudge! Any idea when more will be available? Received the MF Blend and will use it soon in a mid-gravity grist of pils, wheat, and oat malts. Plan to skip kettle hops and just go with fruity/citrusy dry hops. When you no hop/dry hop your funky beers, what is your timing strategy? How long do you like to wait before hopping? Not sure what the release schedule will be like. Seems like it sold pretty well, looking forward to getting some word of mouth going as people brew with it! For dry hopping, it depends on the beer. Usually close to when I'll be drinking it. Sometimes that means aging for 12-18 month, sometimes that is a few weeks. Depends how much acid/funk I'm looking for. Just brewed a riff on my Nu Zuland saison in Nelson, New Zealand with flame-out hops and brew-day dry hops because it'll be consumed in about a month! Brewed your Saison 'Merican with your Bootleg Biology yeast on 3/24. 1.051 OG 1.004 FG. Pitched and fermented at 73. Dry hopped 4/4 with 3oz. table sugar. Removed dry hops 4/9. Started drinking 4/15. Wow. Love the beer. Love the yeast. You won't be surprised to hear that this is the first time I used your yeast, but as I've been a homebrewer for 25 years, you may be surprised to hear that I had never used Mosaic or Nelson Sauvin before. This is one of the most interesting beers I've ever made. I'll be using the yeast, and probably the hops, regularly. Thanks. Keep up the good work. Cheers on the success! Glad the kick to try something new worked out. Thanks for reporting in! So I have a question that I'll get to in a minute. First, as an experiment, (without notes or controls of course), I wondered what would happen if I threw any old thing directly onto the Saison'Merican yeast cake (4/23 post), so I did... Six lbs. Munich LME and 1 lb. Turbinado, and 3/4 oz. Magnum at 30 minutes(29 IBU) in a 45 minute boil. The end result was surprisingly good. Good enough that the night I kegged this, I drank two glasses, room temp and flat, even with two chilled and carbed options on tap. My question is this: I use the Brulosophy 'Sloppy Slurry(no starter) method of reusing yeast. Since your saison yeast is a blend, do you have any idea how long I can get away with that? That's pretty much what I've been doing for three years... sometimes a direct pitch, sometimes harvesting from a keg with a starter. The culture seems pretty stable. Keep going until it stops performing for you! Just brewed yesterday and pitched your Saison blend. Whirpool with IC down to 66F and pitched. Fermentation kicked off over night. I'm really looking forward to seeing the fermentation character this yeast culture brings to the beer. I'm going to give it about 4-6 weeks, taste a sample, and then figure out dry hopping choices based on taste. I'll post results once it's done. Thanks for putting this yeast culture out! I just brewed a 10 gal split batch on May 2nd and pitched your Saison blend. 70% pilsner, 15% flaked wheat, 15% flaked oats, 1oz east Kent Golding hops @ 60 min (10 ibu's). Pitched 1 pack of your Saison blend into each fermenter @ 70* and held at 72*. I was planning on fruiting at least one of the 5 gallon batches. However considering the yeast blend will dry the beer out quickly leaving little for the low-attenuating Brett to ferment, it doesn't seem the beer will benefit much from extended aging prior to racking into fruit (please correct me if I'm wrong). My question is, should I plan to rack onto fruit as soon as the gravity is stable, which I'm assuming will be somewhere around 3-6 weeks? Or should I let it ride until my desired level of acidity is achieved? Excited to hear how they turn out Brian and Chad! Brett will continue to develop character even without dextrins, but the beer won't get any more acidic (it produces bare tartness even with 10 IBUs). So you could age it to bring the Brett character up before adding fruit if you wanted. I tend to use it for relatively quick-turn beers often 4-6 weeks grain to glass. Haven't used it in a fruit-forward beer, but it blends well with citrus, white wine, even darker flavors like date. Thanks Mike! Given this information I think I'll reconsider my decision to add fruit and go a different direction, maybe Chardonnay soaked American oak, dryhopping and or bottling with pear juice. As always thanks for the quick reply! Just wanted to share the results I got from my first batch (also shared on Milk the Funk). I made a pretty basic saison recipe and hopped to about 22 IBUs with Hallertau Blanc (60 min and late addition hops). It was at 1.006 after three weeks and I kegged it with another oz of dry hops. The beer is getting better as it conditions and I really like it, a very nice white wine character and some lemon grass on the nose. The one thing that surprised me is how sour it got, the lacto seems more hop tolerant that I would have initially guessed. I also used the culture for a sour red that's been in the fermenter for over a month, no hops on this one. It also tastes great, a bit more on the funky side and a nice clean sourness. This will make a nice addition to my blending stock. The acidity surprises me too. I've never had it get more than barely tart, even with fewer that 20 IBUs. Cheers, and thanks for reporting in! I went verrry low on the IBUs on my brew with this - .25 oz of 3.9% Ahtanum into 1 gallon of wort at flameout - hoping for 3-5 IBUs. I doubt I even got that, considering how quickly that small of an amount of wort cools down. I'll be curious to see how sour it gets. Mike - once it reaches terminal gravity, will it continue to sour in the bottle, or is it necessary to keep it in the fermentor for that to develop? If it is truely at final/stable gravity it won't continue to sour in the bottle or fermentor. Lactic acid bacteria need sugar to convert into lactic acid. The Brett will continue working though! I have a couple questions regarding a starter with MFSB. I've made some Brett starters in the past and they didn't floculate that well, unless you give them a long, long time to do so. What have you found to be the case for MFSB? Do you pitch the whole starter? Or decant and then pitch? Also, this is my first starter that has lacto. What is the recommended way to handle starters that have lacto in them? Are all of these answers in your book? If so, let me know and I'll go buy a copy ASAP. Thanks in advance! I generally don't make starters with it, I just harvest and repitch. When I do make a starter because it has sat in the fridge for a few months, I just do a small starter the day before brewing and pitch the whole thing. Luckily Lacto doesn't mind oxygen. There was a study that suggested L. brevis grew more rapidly on a stir-plate, but mostly oxygen isn't beneficial or harmful. And yes, pretty much all of that (plus a lot more) is in the book! Received my culture in the mail yesterday and brewed on the same day. Decided to a riff on my rye saison recipe, with a bit of smoked and roasted malt. Cold steeped the roasted malts over night and added to the last 15min of the boil along with the D-180. Started at 68, slowly ramping up to 80. Fermentation started after 12 hours. Using only foil (no airlock). Once FG is stable I plan to rack to secondary onto port soaked med french Xoakers. I will keep you posted on the development. Sounds good, glad you went light on the smoke and roast given how attenuative the blend is. I have a dark/rye/funky saison on my schedule for this weekend! Does your blend contain a saison blend or a single isolate saison yeast with the other microbes? Thanks, can’t wait to use the latest release. Two saison strains, one "wild" Sacch, one Brett, and one Lacto. I'm looking forward to getting my pitch at the end of this month... looks like a tasty recipe to try the blend out on! Any suggestions for alternate hops if I can't get ahold of the one you guys used? Just a lot of saaz maybe? I might go something like Sterling or Northern Brewer, maybe a blend? It'd be difficult to get the IBUs with low low AA% Saaz has been coming in. No harm moving to a 60 min bittering addition if you'd prefer. 1. I'm thinking of fermenting your blend with just a loose foil cap on the carboy. Have you fermented your blend that way? I was thinking if it contains the dupont strain, that might help prevent a stall, but I guess a stall leaves more room for the brett to play. Any thoughts on that? 2. This will be first sour/funky brew. I'm thinking of no hops in the boil and only a 15 or 20 minute boil. Then, I'll dry hop a few days before packaging. Is this an easy way to go? 1. I don't think there is much difference between an airlock and a loose foil cap for primary fermentation. The amount of pressure added by so little water is insignificant. I often ferment saisons with the bucket lid only resting on top, just in case the krausen wants to get too high. Totally open is another story, especially with a mixed-fermentation, the oxygen interaction can create some interesting character. 2. Good plan if you want acidity! I haven't tried the blend without hot-side hops, but several people have gotten firm acidity from low IBUs with the blend. I'll be finishing up a batch of beer using your blend, and I was thinking of splitting the cake between another beer and a cider. Have you tried your house blend with cider at all? If it is just cider, will I get any acidity from the LAB? Or will the sacch just chew through too much of the sugar? I haven't, but hefe and saison strains have gained some popularity in ciders (without much ferulic acid, they don't tend to produce the same spicy flavors). You may get a little acidity, or a lot. The Bootleg version seems to have more lactic acid bacteria that my original, I've heard from several people who have gotten really sour beers despite 15+ IBUs. Let me know how it turns out! On August 26 I pitched a fairly fresh (packaged on 7-28) pouch of the Mad Fermentationist Blend into 5.5 gallons of unhopped 1.044 wort (67% pils, 22% rye male, 7% acid malt, 4% flaked rye) with a 30 ml dose of lactic to bring down the pH to help the lacto not destroy the head retention. It fermented down to 1.010 in 2.5 weeks. It's been at 1.010 since then. Do you think it's done? Has it stalled? What should I do?!! BTW, it tastes great. Fruity and juicy. Pineapple, lemon awesome. Hard to know for sure. That is a higher FG than I usually end up with, but at a month it is usually done. I'd give it another week warm and call it finished if it is still 1.010. Glad it is tasting good!